Buddhist monks (bhikkhus) in Sri Lanka represent a lineage of holy seekers that stretches back for 2,500 years. This ideal of the spiritual life is still much venerated. It is characterized by a peaceful life-style and outreach to society. But political events in largely Buddhist countries like Sri Lanka and Burma sometime gravely affect the monastic order. Religion can become used for nationalistic, cultural and ethnic communalistic purposes. These two monks from the highlands of Sri Lanka tell a story of continuity. The seated monk is one hundred years old, and the young monk is fifteen. They essentially share the same world view, perpetuating centuries of tradition and practice. A frequent scene in many South and Southeast Asian states is that of military personnel, as here in Sri Lanka. In so many ways, these have become important influences in government policies, including sensitive ones affecting human rights and minority cultural rights. For example, a civil war in Sri Lanka lasted from 1983 to 2001 and cost thousands of lives. The war had a Sinhalese cultural aspect to it that harnessed Buddhism for partly political purposes. In 2003, a tenuous ceasefire is in place between the government and the Liberation Tigers of Tamil Eelam. A collateral research theme is cultural and religious minorities. For example, thirty percent of Burma's population is comprised of ethnic minorities. Among these, the Rohingya Muslims in the western Arakan region (Rakhine State) are among the most distressed by lack of civil rights and exposure to serious human rights abuse. This image at left is of a Rohingya mosque in Sittwe. A further leading interest of mine is the Little Tradition or indigenous spirit religion of Theravada Buddhist South and Southeast Asia. A common sight everywhere: 'sprit houses', in this case at a residential intersection in downtown Rangoon, Myanmar (Burma). Here I am with Laytoo Chin children on the upper Lemros River, Rakhine State, Burma. In rural South and Southeast Asia, primary school education is still sometimes offered by religious teachers. 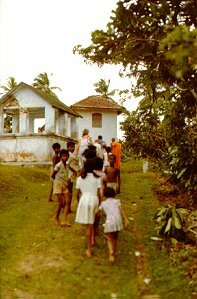 Here, a Buddhist monk in Sri Lanka leads his pupils into class (the lady in the middle is Pam). 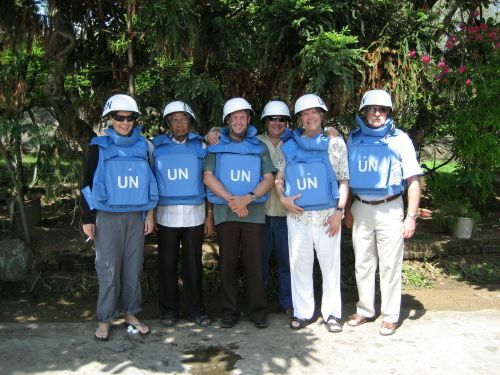 In 2007, I became the Canadian member of the Independent International Group of Eminent Persons (IIGEP), working in Sri Lanka on invitation of the government to observe and advise the Commission of Inquiry into Alleged Human Rights Abuses. The IIGEP was under the Chairmanship of P.N.Bhagwati, the former Chief Justice of the Supreme Court of India, and was comprised of ten other members. The IIGEP resigned in March, 2008.